On October 11, 2012, the University of Michigan-Flint set out to document 24 hours in the life of the university. 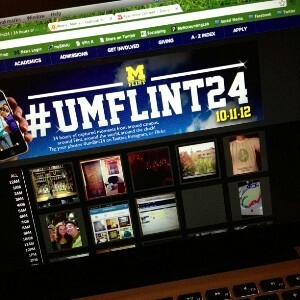 The campus community was asked to take photos between 12:00 a.m. and 11:59 p.m. and share them via Twitter, Instagram, or Flickr with the #umflint24 tag. The goal of this project began simply enough—to accurately portray life at UM-Flint through the voices of those living it. But would those people participate? Aside from the University Relations staff working for 24 hours straight to capture images (don’t feel too bad for us; we took shifts), who could we count on to take part? We did our best to reach out to students, faculty, staff, alumni, and others. Until the day unfolded, however, we had no idea what to expect. We were so beyond pleasantly surprised. We were blown away. Below is a summary of #UMFLINT24 on October 11. See what #UMFLINT was all about at umflint.edu/umflint24.